I read the October book selection for The Kitchen Reader , chosen by Domestic Wanderings. Despite finishing the book 3 weeks ago, I am finally carving out time to write up my thoughts. Since there are few things I love reading about more than food, this is pretty much my dream book club. This month’s selection was Spiced: A Pastry Chef’s True Stories of Trials by Fire, After-hours Exploits, and What Really Goes on in the Kitchen. 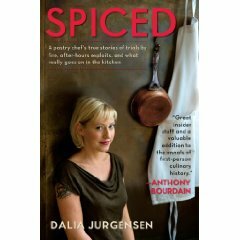 Authored by Dalia Jurgensen, this book is true to its title, chronicling her journey from office worker to pastry chef. This is one of those books that has been on my radar for awhile, but that I’d never gotten around to reading. Overall, I thought it was an interesting and entertaining food memoir. It gave me a new perspective on restaurant life, particularly in NYC. I enjoyed Jurgensen’s unpretentious narrative voice, and her exploits in various kitchens around Manhattan made for an engaging read. I enjoyed reading about the way Jurgensen created desserts. The process of making chocolate (which I had never understood before) awed and inspired me, and her beginning mistakes at Nobu made me giggle. I also thought the portion of the book detailing the restaurant world’s response to 9-11 was really touching- it was a perspective on that awful time that I had never heard before, that completely warmed my heart. This book does not make it to my favorites shelf, mainly because I didn’t love her writing style, and I also couldn’t relate to a lot of the material. Although I am a huge fan of boldly pursuing your dreams, I was pretty shocked and disappointed by the realities of “behind the scenes” in the kitchens. It was a huge turn off to me. The lack of work/life balance or any discussion of personal wellness, the misogyny, chauvinism and homophobia, the disdain for waitstaff… all of it reinforced my perception that restaurant life is not for me. At least, not that kind of restaurant life. I also thought the book finished on a rather flat note, with Jurgensen discussing all of the future challenges and drawbacks facing her career while working in a kitchen that seemed a great fit financially but definitely not socially. When I turned the last page, even after reading the brighter final paragraph, I still felt disappointed. There was no triumphant conclusion, no trumpeting of the value to following one’s dreams. Though I am not so naive as to believe that Jurgensen will ride off into the sunset on a magical unicorn, making desserts and feeling completely fulfilled in all aspects of her life, it was such a let down to leave this book after a 274 journey on such a depressing note. I wonder what she is doing now, how she confronted these challenges over the past couple of years. The book’s website hasn’t been updated since 2009, so I guess it will remain a mysery. In sum, this is a book that I am glad to have read, because I am walking away inspired with new ideas for my own kitchen and a greater appreciation for the work of pastry chefs. I’ll pass this book along to a friend, though I may not come back to it myself. Can’t wait for November’s selection, Kitchen Reader! Thank you for mentioning Dahlia’s recounting on the events of 9-11! I really feel remiss for not including that in my review. The efforts of all involved in that tragic day are truly inspiring and should not be forgotten. I enjoyed your review and look forward to reading your next one! I really found myself intrigued by her process for developing dishes; her desserts were quite inventive! Perhaps she thought about writing a second book and that’s why the first was left hanging? Kitchen life seems terrible to me…! Thanks for your review. I wondered if she was thinking about a second book as well Sarah! Who knows, maybe she’s working on one now….